Twenty Twenty Grille, located in Royal Palm Place in the heart of downtown Boca Raton, FL, has a menu that goes far beyond contemporary American cuisine. It represents a Culinary Fusion of International classics and modern food art. World-Famous, Internationally Acclaimed Chef Ron Weisheit uses Organic Farm-raised produce, line-caught seafood, South Florida seasonal produce and sustainable grass fed meats to artfully transform his dishes into delicious masterpieces of modern day art cuisine. Chef Ron has been in the culinary field for over 25 years. He was a top graduate of San Francisco Culinary Academy and was awarded 3 gold medals at te Culinary Olympics in Germany. He has recently been nominated for a James Beard award. Rhonda Weisheit, Ron’s wife and business partner graduated at the top of her class in Portland at the Maine Culinary School and was the Executive pastry chef for a number of years. Together, they’ve developed menu items that span from international classics to more extraordinary and adventurous. The unique concept of Twenty Twenty Grille is that this dynamic duo are not only satisfying their guests with Food Art, but also educating them on the origins of their dishes and how they were inspired. It is an exceptional blend of tasting and learning experience. “It has always been a dream to open our own fine dining restaurant in South Florida and share our passion for healthy and creative cuisine”, says Rhonda. Both Ron and Rhonda are talented and creative chefs and very passionate about what they do. Every dish they offer has its own unique melody and together it creates a marvelous symphony of taste. Before fulfilling their dream of opening up a fine dining establishment here in sunny South Florida, Ron and Rhonda also owned and operated Pralines Bakeshop and Catering for 8 years in downtown Newburyport, MA. It was awarded the Best of Boston Award and was also featured in the Food Network’s program “Cupcake Wars”. Ron and Rhonda are known throughout the community for having amazing customer service as well as preparing all of the menu items from scratch. To dine at Twenty Twenty Grille is to experience sheer excellence in culinary art and hospitality. Guests are invited to enjoy the finest and most unique modern cuisine under the romantic stars at this boutique garden restaurant. 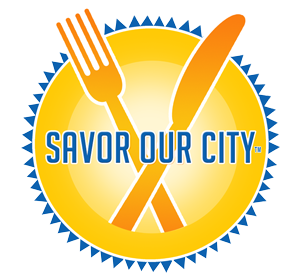 Twenty Twenty Grille is also a stop on Savor Our City’s tours from time to time and we couldn’t be happier to introduce our guests to this wonderful little gem. I recently stopped in for a bite to eat after attending a fundraising event which was taking place nearby in the plaza. I must preface that this is the type of place to come enjoy a leisurely meal. It is an experience and if you are in a rush, you might want to think about coming another time to really appreciate it to its fullest. My evening began with an Amuse Busche of sticky Asian pork belly with elephant garlic. This little bite is supposed to whet your appetite and leave you wanting more and that is exactly what it did! My server Thomas recommended a glass of their Peter Yealands Sauvignon Blanc ($11) from New Zealand for the pairing, which was spot on. Next up was the micro greens salad ($14) which comprised of six different microgreens from a local farm in Boynton Beach, along with fresh mozzarella, grape tomatoes and a house made sesame lime vinaigrette. Twenty Twenty Grille is famous for their unique made in house butters which change nightly. On this particular evening, I was presented a chocolate dipped cherry butter served with fresh warm bread. I had been craving foie gras and when I saw it on the menu, I just had to splurge. A beautiful plate of pan-roasted foie gras wrapped in prosciutto was set atop Fuji apples and nestled between lemon basil and Concord grape sauces; the pairing for this course was an Antigua CA muscat dessert wine ($25). Divine. Truly an exceptional dish. The combination of flavors dance on your taste buds. The saltiness of the prosciutto plays nicely with the richness of the foie gras and the sauces and the sweetness of the wine tied it all together. The portions are not meant to be large, so you will want to savor each bite. Intermezzo – Chef Ron likes to invite his patrons to try and guess what ingredients are used in his nightly palate cleansing sorbet. On this particular night, I was both pleased and disappointed that I only got one of the four ingredients right. I guessed: ginger, green tea, garlic and turmeric. The actual ingredients were: kale, pear, turmeric and star fruit. Well, it was great tasting and fun to test my palate. Maybe I’ll get more on my next visit. The sweet ending: I decided to try the guava skicky pudding cake ($10) which came with a Grand Marnier caramel sauce, fresh whipped cream and berries. It was a perfectly balanced dish in taste and textures and a great way to end the tasting. In case you were wondering about the meaning of the name of the restaurant…Twenty Twenty represents the number of seats at the restaurant; 20 inside and 20 outside. Twenty Twenty Grille is open every evening from 5 – 10pm. Reservations are suggested. Call (561) 990-7969 or visit their website.